Feb. 7, 2019–How is it possible that, with 71% of the earth’s surface covered with water, we have a shortage of fresh drinking water on the planet? Might one of the reasons be that, in addition to criminal underdevelopment of the developing nations, some U.S. water infrastructure goes back to the Civil War era and has not been upgraded for more than 100 years? Water fountains in Flint, Michigan schools. When water problems erupted in Flint, Michigan in 2014, people thought it was an isolated case. But since then, other areas of the country have sprung leaks. To put this into a global context, Michigan, because of its location within the Great Lakes Region, supplies 20% of the world’s fresh water. Water and infrastructure are vital to the health of our nation. It’s time to pay attention. Since the Flint water crisis erupted, further cases of dangerous water deterioration have grabbed headlines. Over the last several months, these crises have been concentrated in school systems around the country. Federal regulations neither require schools to test their water nor have a single health standard for drinking water. The resulting patchwork of state policies can have a big impact on how—and whether—they respond to lead found in the water. 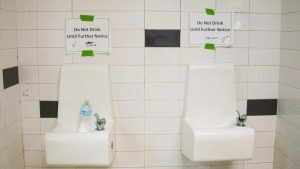 Only 24 states and the District of Columbia require schools to test water for lead or have programs to conduct that testing, according to a report from Harvard University and the University of California. State water testing policies lack uniformity, including regarding how much lead triggers a response. Even among federal agencies, there are different thresholds for how much lead is acceptable in drinking water. Pittsburgh has now joined Flint as the venue for new prosecutions for lead poisoning. On Feb. 1 Pittsburgh’s Water and Sewer Authority (PSWA) was criminally charged with mishandling a lead pipe replacement program; it faces a possible $2.4 million in fines by state environmental regulators. High levels of lead in the water have been found over many years in Pennsylvania, and Pittsburgh is under a state mandate to replace 7% of its lead service lines per year. 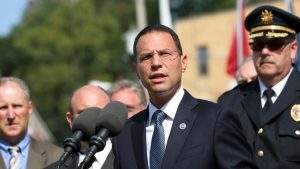 Pa. Attorney General Josh Shapiro announces criminal charges against Pittsburgh utility. According to AP, in 2017, Allegheny County Controller Chelsa Wagner accused the water authority and local health officials of failing to adequately protect residents from lead, likening Pittsburgh to the water crisis in Flint, where 15 defendants faced criminal charges over lead in the drinking water supply. Lara Fowler, a senior lecturer in law at Penn State and assistant director of the university’s Institutes of Energy and the Environment, told The Incline that attempts to hold utilities accountable are becoming more common nationwide. “I think it seems to be getting more common because people are super sensitive about the lead question,” Fowler said, pointing to the lead water crisis in Flint, Mich., and one building right now in Newark, N.J.
Ironically, the penalties for lead in the water would be put on the backs of the people. PWSA officials said a fine would ultimately come from sewer and water fees paid by ratepayers. It might even result in a rate hike in the double digits. Water is not a constitutional obligation? Meanwhile in Flint, investigations into the water crisis are being taken over by the newly elected Democratic Attorney General Dana Nessel. These involve hundreds of civil lawsuits representing tens of thousands of victims. According to an article in The Guardian on January 18, 2019, “Critics complained that the three years investigation by the Republicans were grossly insufficient, resulting in little accountability, with no fines or jail time.” Nessel charged that previous prosecutions were conducted as “politically charged show trials,” aimed at benefitting her predecessor, Republican Bill Schuette. Although initially the special prosecutor appointed to deal with the lead crisis charged suspects with felonies, his team ended up negotiating plea bargains for misdemeanors. For this, Schuette spent over $25 million in taxpayer money on legal fees. A demonstration in Flint in response to the water crisis. 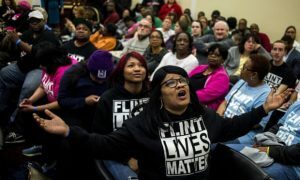 The Flint water crisis erupted when the financial manager appointed by the state in April 2014 ordered the city to save money by pulling water from the Flint river instead of purchasing it from Detroit. The first sign of trouble came with an outbreak of Legionnaires disease which killed 12 people, and was considered by some experts to have been caused by the contaminated water. Soon after, residents began experiencing lead poisoning symptoms. In an egregious statement, reported by the Guardian, Schuette has argued the state doesn’t have a constitutional obligation to provide clean water. I am writing to express my deep concern that you are seriously thinking of declaring a national emergency to fund a proposed $5 billion border wall. I want to bring your attention to a true emergency that puts millions of our citizens at risk: The decaying infrastructure of our water systems which has created a crisis in Newark, the State of New Jersey and across America. Dangerously high levels of lead are entering homes and our children’s blood through lead service lines despite the fact that any level of lead can damage the developing brains of young children. Besides Newark, more than 20 other New Jersey cities and towns have elevated levels of lead in their tap water, and so do thousands of municipalities in our nation. This crisis, mainly, affects older black and brown cities with limited resources and serious health issues that are systemically overlooked by every level of government. In prioritizing environmental justice, saving children and their families within these cities is a must. Although the situation in Newark is very different from that of Flint, our need to replace lead service lines is equally urgent. I join in solidarity with the I I-year-old girl known as Little Miss Flint who told you that spending $5 billion to make water safe is a much better way to protect Americans than building the wall. In the short term, we are distributing 40,000 water filters and cartridges to affected homes in Newark. We are also changing our corrosion control system. But, the only real solution to save this and future generations of children is to replace lead service lines. It will cost an estimated $70 million to replace the lead service lines in Newark, hundreds of millions more to replace them in New Jersey, and an estimated $35 billion to replace all of the lead service lines in America. Achieving this is possible only with financial help from the federal government. You have been saying that a border wall will save thousands of American lives, but that’s simply not true. Instead of wasting billions of dollars to keep an ill-conceived campaign promise, I urge you to use our resources in a way that will truly save American lives–help repair our nation’s deteriorated water infrastructure. According to a new report from the National Association of Corrosion Engineers (NACE), a group created in 1943 by 11 corrosion engineers from the pipeline industry, U.S. infrastructure is reaching the end of its economically useful and serviceable life cycle. “Today, bridges, pipelines, roads, power generation and transmission, and water treatment facilities [are] all are at risk of corrosion-related failure,” according to the Association’s 2019 Spotlight on Corrosion Report. 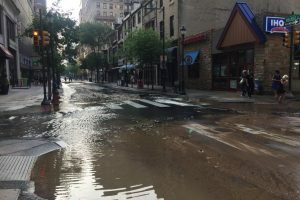 A water main break in central Philadelphia in mid-2018. The cost of dealing with corrosion in infrastructure facilities across the world is estimated at $2.5 trillion, the report found, but applying advanced existing techniques could save up to $875 billion of that sum, or about 35% of the cost. According to American Society of Civil Engineers (ASCE), which gave the state of U.S. drinking water a D in its 2017 infrastructure report card, we would need $1 trillion over 25 years to fix the problems with the U.S. water supply system. Presently the ASCE estimates that, between 2016-2025, only 30% of the funds required to meet the needs for potable water infrastructure will be met. These sums appear “out of sight” to most politicians. Yet if the draft legislation for a National Infrastructure Bank modeled on Alexander Hamilton’s Bank of the United States, proposed by associates of this blog, were enacted, we would have the trillions of dollars needed to get these projects underway. There is no doubt that we must take immediate action in replacing our decrepit water system, but it is also urgent that we apply new advanced technologies to further address the problem. The mere fact that one-fifth of the world’s population has no access to safe drinking water, particularly in Asia and North Africa, is unconscionable. Since the oceans hold 96.5% of all earth’s water, they seem to be the obvious place to start. The solution lies in desalination and nuclear power. 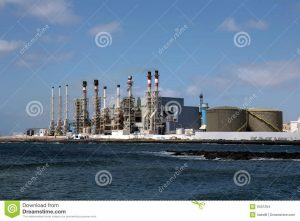 U.S. News took up this issue in a January 4, 2019 report on desalination plants in the United States. One study from 2016, they report, counted more than 1,330 plants in operation. The largest, in Carlsbad, California, supplies 50 million gallons a day to some 400,000 residents in San Diego County. The process being used was pioneered in the U.S. The Bureau of Reclamation funded an office on saline research as early as the 1950s. Those alternative technologies include nuclear desalination, which is already a proven method on the U.S. nuclear submarine fleet, and in countries such as Japan. A review of the state of research on this scientific frontier is available here. The increase in application of this method depends heavily on the willingness of governments to back the research and construction required. On the table, for example, is the construction of small modular reactors which could provide both power and desalination. Fine words, but we need the commitment from both the Administration and the Congress to get the job done. Why wait? The solutions are there. We must demand from our leadership that they implement them now.